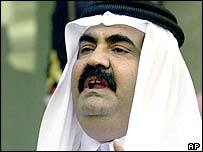 The emir of Qatar has received his father back to the country for the first time since he overthrew him nine years ago. The former ruler, Sheikh Khalifa bin Hamad Al Thani, returned to Doha on Thursday to attend his wife's funeral. "Emir Sheikh Hamad bin Khalifa Al Thani led [royal family members] who greeted him," the official news agency said. It was not clear how long Sheikh Khalifa, known as the "emir-father" will remain in Qatar. He has lived in Europe, mainly in France, since he was ousted in 1995. His son, Sheikh Hamad, has visited him several times in Europe, but this is the first time Sheikh Khalifa has returned since the coup. Recently the emir named his younger son, Prince Tamim, as crown prince, to replace his other son as heir apparent. A court statement said Crown Prince Jassim, 25, would be replaced by Prince Tamim, 24. The Al Thani family dominates the political scene in Qatar, but there has been a history of palace intrigue since the state gained independence from Britain in 1971. Qatar possesses the world's third largest natural gas reserves and its small population has one the highest per capita incomes of any country. A key US ally in the region, Qatar hosted the advanced headquarters of the American forces during the US-led invasion of Iraq.